Schaap en Citroen has the most advanced wath service center in the Netherlands with direct service for Rolex, Omega, Hublot and Cartier. 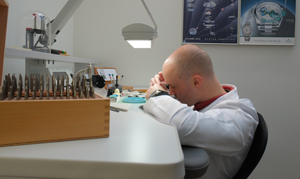 In our service center we have twelve certified watchmakers. Our service workshops can be found in Amsterdam, Utrecht, Rotterdam and Maastricht. Wind your mechanical watch on a regular basis. Even if you do not regularly wear the watch, wind it at least once a month. This ensures that the lubricants remain elastic in the timepiece. When winding your mechanical watch take your watch off your wrist to damage the mechanism as little as possible. Always wind your watch clockwise with the hands. In general, it is better not to adjust your time between 9 pm and 3 am, as this could damage the date mechanism. Make sure your watch is not in direct contact with magnetic fields (such as speakers, TV, microwave, magnetic closure, iPad case, etc.). Even though your watch is "shockproof" always try to protect against hard knocks and shocks. Tennis and golf are risky sports for your watch. If the glass of your watch breaks or cracks, have it replaced immediately. Even through a small crack in the glass dust and moisture penetrates and damages the interior. If the battery in your watch is empty, have it replaced immediately. Exhausted batteries may leak and this could damage the interior. Never wear your watch in the sauna, as the seal on your watch can deform by the heat. If there is water or condensation inside your watch, have it checked, even if the watch is still running. A common misconception is the water resistance of the watch. Make sure you are well informed about this and check the warranty. Moisture causes corrosion, which can damage the watch severely. The water resistance of a watch is guaranteed by various rubber gaskets in the watchcase: around the crown, the back cover, the glass and possibly the pushers (buttons). These gaskets are permanently under pressure and may be affected by moisture, detergents, UV radiation, dirt as well as wear and tear on the watch case. As a result, the rubber dries over time. This decreases the water resistance. It is essential that the wearer checks his or her watch annually for water resistance. When replacing a battery, we replace all gaskets and we test if the watch is waterproof. A mechanical often shows small time differences. The exact time can only be ensured with an electronic watch (radio controlled). Depending on the quality of the watch, the time on mechanical watches may vary from -5 to +10 seconds per day. The Swiss Official Chronometer Control tolerates an average deviation of -4 to +6 seconds per 24 hours. The high demand for a minimum time-loss of several seconds per day can only be made on the modern brand watches like Patek Philippe, IWC, Omega, Vacheron Constantin, Rolex, etc. Schaap en Citroen regulates modern mechanical watches to be about +10 seconds per day. Wearing the watch has a slowing effect at all times, so the watch is always adjusted to +10 seconds. Vintage and antique watches may vary more because of tear and wear. Age also plays a role. As oil ages, a watch will also run more slowly. After the oil is about 4 years old it requires major maintenance. Thus, internal damaging is reduced to a minimum. To provide a perfect adjustment of the watch, the watchmaker will balance the spring, the heart of any mechanical clock, again. ensure comprehensive testing and long-term observations that the timepiece is functioning exactly. Your strap needs servicing. Depending on the material, we recommend the following maintenance tips. Leather is a wonderful natural product and as a watch strap is very suitable. Quality straps are sometimes very expensive, which may be due to the special leather, design and / or craftsmanship. For optimal maintenance, do not wear at night so the leather gets rest. If the strap gets wet by water or sweat, let the strap dry before the watch is worn again. In very hot weather, it is best to loosen the closure by adjusting a hole or take off the watch a few hours. The leather becomes less humid and the strap doesn't smell. For exercising or performing or rough and wet work, it is best to take off the watch. Through the use of a butterfly clasp the strap will live longer. With a buckle clasp the strap breaks first at the place where it closes. Metal straps may cause a black wrist. That's because there are contaminants on it (sand, fine dust, sebum etc.). Make sure you have strap cleaned ultrasonically on a regular basis. Heavy watch straps are often lubricated at the hinge pins. This slows down the wear and tear. You can maintain your metal strap, if necessary, along with the periodic maintenance performed on your watch. Your watch deserves the best possible care. Like any other precision machinery, a high-quality watch should also be checked regularly. To ensure long life and long-term reliable performance, maintenance and repairs must be carried out according to strict brand specifications. Therefore only original parts will be used. This chapter takes you through the steps that are performed at periodic maintenance. Thanks to a unique numbering and identification, your watch always undergoes the proper maintenance and repair procedures. First, a highly skilled watchmaker makes a comprehensive analysis of your watch, the cabinet, the strap and - especially - the movement controls meticulously. He can determine what maintenance your watch requires. The next step consists of the opening of the cabinet and the removal of the watch strap. The timepiece is taken out of the cabinet, and all the parts are taken apart. More complex movements consist of hundreds of individual components. All parts are then cleaned in the appropriate liquids. Only when all parts are cleaned, each part will be separately checked in detail. The watchmaker replaces any parts that show signs of wear or that could interfere with the precise operation of the timepiece. Here he follows the manufacturer's instructions closely. There's a specific lubricant for each individual component. Special oils of different viscosity are applied exactly where necessary. Through an electronic machine, the watchmaker can detect deviations and errors in the course of the movement. To provide a perfect adjustment of the timepiece, the watchmaker, adjusts the balance spring, which is the heart of any mechanical clock. Extensive testing and long-term observations guarantee that the timepiece is functioning correctly. After the watch is cleaned in an ultrasonic bath, damaged parts will be replaced. The case is prepared and polished by hand, so the watch gets its sophisticated appearance back. Finally, the watch is carefully put together and all seals are replaced. The watch is checked for tightness through quality testing equipment. 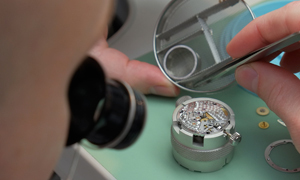 Each step in and after the maintenance process is extensively checked in the watchmaker's workshop. Finally, the watchmaker monitors all key parameters of each component again. 13. You will receive your watch. After an extensive service and repair Schaap en Citroen will provide a 2 year warranty on the performed work. This warranty does not cover tear and wear or damage caused by improper handling of the watch. The maintenance warranty is void if the watch is opened by an unauthorized third party or if non-original parts are used. At Schaap en Citroen jewellers we believe that service does not end with the sale of a watch. If you have questions about the warranty on purchases you have made with us, do not hesitate to ask them. The fascinating thing about a watch is that modern technology, traditional values and craftsmanship are combined. The brands in our shops all use modern resources to develop sophisticated and high-quality watches, often in accordance with old traditions. The ones who practice the art of watchmaking today proudly continue the work of their predecessors: watchmakers, engravers, leather workers, etc. It is important to note that the jewellers who offer their creations have the same passion and insights. After all, it is about much more than watch advice on what suits you best; maintenance and service are equally important. And the service is supposed to be perfect because it often involves more than one might think. At Schaap en Citroen, we exactly know what your watch needs. Our watchmakers ensure the optimal performance of your watch, whether you wear it on a daily basis or after several years. They ensure that the lubricants used in the mechanism of your watch do not harden, which seals and gaskets need replacement and all parts that need to be checked for tear and wear. Even if you would come to us for a simple act, you will witness a flawless service; even when you want us to replace a battery in a quartz watch. You can count on your watch is being cleaned, the cabinet parts and gaskets are inspected and that the operation is carefully checked. The exterior of your watch also deserves attention: we can thoroughly clean and polish the case and replace it with a new strap. If your watch has been serviced, in our workshop, it’s carefully tested for its accuracy, power reserve and the tightness is checked. At the moment everything has been checked, we will contact you so that you can pick up your watch at one of our stores. Would you like us to service your watch, please contact one of our stores or fill in the form so we can contact you.